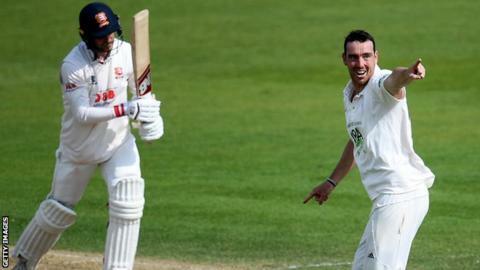 Hampshire fast bowler Kyle Abbott feels new first-team manager Adrian Birrell has already created an air of calm and confidence since joining the county. Abbott took 5-77 as Hampshire completed an innings win against Essex in their opening County Championship fixture. "Coming into this game, I've felt it's the calmest I've ever known this team," the 31-year-old told BBC Radio Solent. "In the past, we've had lots of energy but it's been nervous energy where we've been scrapping to stay up." Abbott's seven wickets against Essex enabled Hampshire to take a maximum 24 points and handed former Ireland head coach Birrell a winning Championship start since his arrival in the winter. "He's brought a great sense of calm to the changing room and some pretty simple plans he keeps drilling into us," Abbott, who averages 21.83 with the ball in first-class cricket, added. "It's clear those plans work. There's been a clear path and a clear vision and he's been pumping our tyres and has a lot of belief in us. "After a performance like that, we can only start backing ourselves and it's great to have Adrian on board." Hampshire host Yorkshire in their next County Championship match, starting on Thursday.